NFL Predictions - The Cleveland Browns Looking to Build Upon Strong Finish in 2009: Any team that finishes their regular season with four straight NFL predictions victories would be optimistic coming into the next season, correct? Vegas thought otherwise by placing the Cleveland Browns with 40-1 NFL odds to win the AFC, making them a top-5 underdog for your 2010 NFL predictions. The Browns, though, do have reason for some optimism. On offense, they can start with playmaker Josh Cribbs at wide receiver/running back/ and Wildcat quarterback. Oh, and he returns kicks too, for touchdowns. Jerome Harrison was surprisingly effective at running back. He ran for over 500 yards in his last three games, including a club record 286 yards against the Chiefs. They also acquired several new pieces to their offense, including tight end Ben Watson, OL Tony Pashos. After ridding themselves of two headaches in quarterbacks Brady Quinn and Derek Anderson, the Browns signed Jake Delhomme to run their offense. Delhomme was a mess in Carolina, having lost his confidence, his starting job, and eventually his roster spot. Delhomme is a competitor and, if nothing else, will bring spirit and passion into the Browns’ clubhouse. The team, however, is weak in many of the line positions and at wide receiver so Delhomme might not have the time or the talent to make a crucial difference. The Browns deploy an attacking 3-4 defense that improved as the season went on. They will get NT Shaun Rogers back after an injury-riddled season and have a potential shutdown corner in Eric Wright as well as a playmaking linebacker in Matt Roth. #1 draft pick, cornerback Joe Hadden, will also help. The safeties are questionable as are the defensive ends, and much of the linebacker corps. 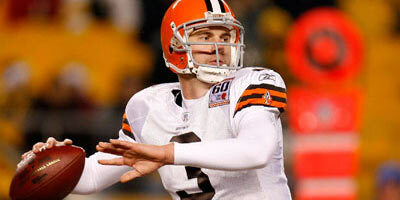 Can the Browns improve in 2010? They will have to do so to please new team president Mike Holmgren and to save coach Eric Mangini’s job. You can Bet the Browns at Sportsbook.com and take advantage of their 2010 NFL predictions bonus.